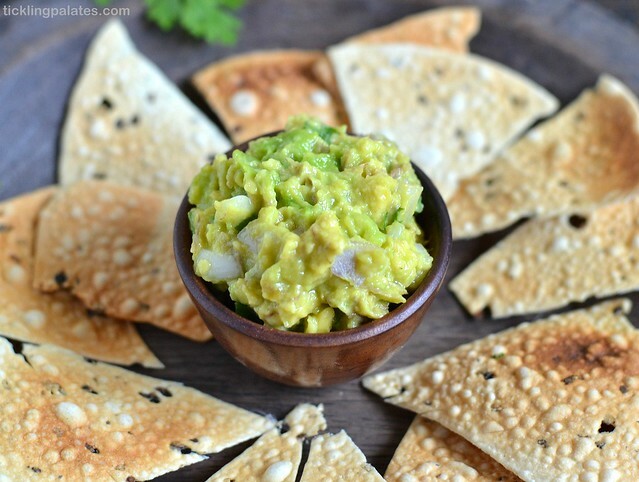 Guacamole is a dip using avocado fruit that originated from Mexico. It is used around the World across many Cuisines as a dip, salad and as a condiment that’s used for stuffing various meats as well. 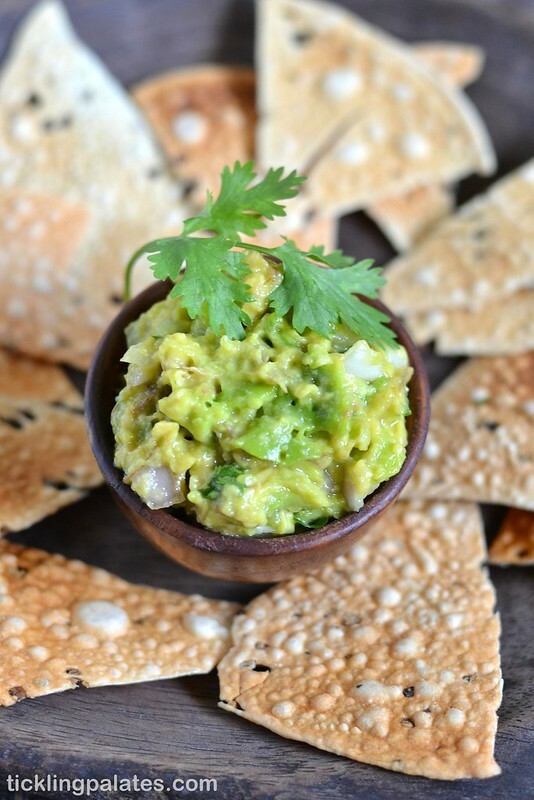 Guacamole is a dish that can be adapted and done in many ways with various seasonings of your choice based on your liking. Basically it is very simple and easy to make and makes a great snack while watching T.V or reading books and you can be guilt free even if you binge on it. After trying out many recipes with Avocado, this is the first time I’m making Guacamole and I loved it a lot. 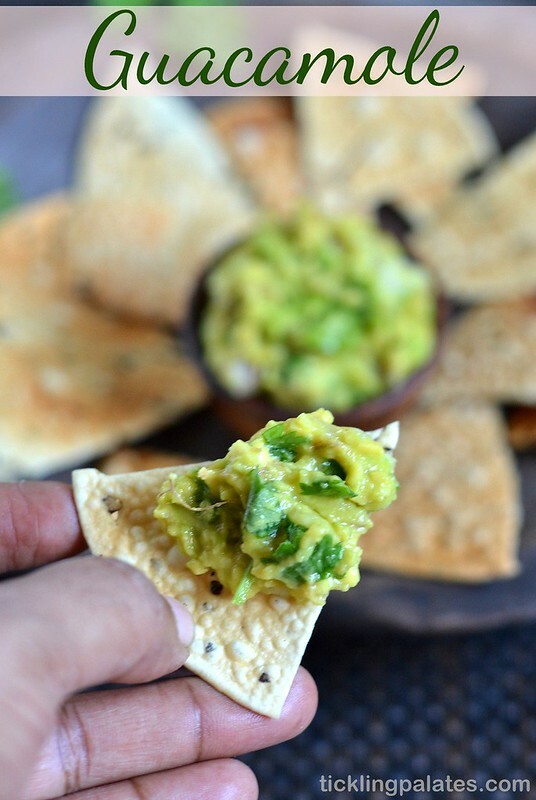 Basically guacamole is served with tortilla chips to dip them in. But since I did not have them on hand, I served it with Desi Punjabi Masala Papads and I must say it was one of the best snacks that I totally enjoyed having eaten in a long time that’s clean and healthy. Instead of frying the papads, I micro waved them for a minute. I still had some leftover, so mixed it with my regular millet and enjoyed it as a salad for my lunch. I have also made a Guacamole Grilled Cheese Sandwich which the kids loved. Avocado being such a versatile and healthy fruit, I had also made a vegan banana bread using Avocado and an eggless, creamy chocolate mousse and an Avocado chocolate peanut butter popsicles where you can not even single out the fruit. You can also add a tomato while making but make sure that you remove the seeds before chopping it and adding to Guacamole. Most importantly, do not skip the lemon juice, it is not only for adding taste but it also prevents the avocados from blackening due to oxidisation. 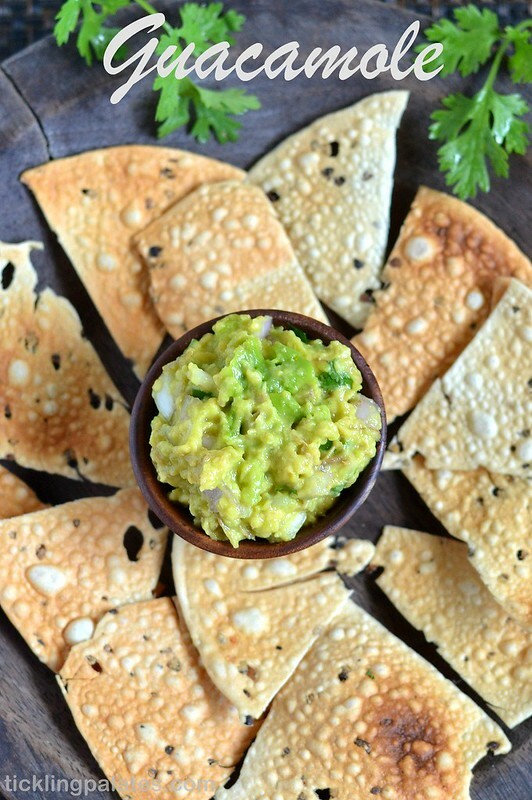 Guacamole using Avocado that is served as a dip with tortilla chips for snacking. Finely chop the onion, garlic and coriander leaves and keep aside. Slit the green chili into 2 length wise and remove the seeds. Mince the chilies finely. 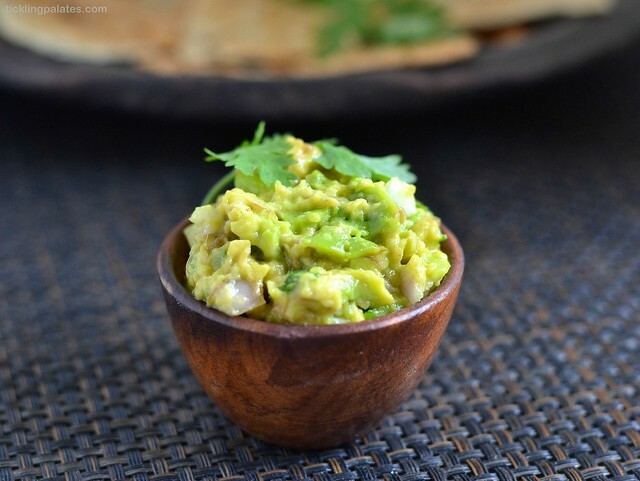 Cut the Avocado into two, remove the seed and scoop the flesh using a spoon into a mixing bowl. Add lemon juice to the pulp and gently mash the avocado using a fork. Add chopped onion, garlic, coriander leaves, chilies, salt to taste and mix well with a spoon. Serve immediately with a platter of Chips or Nachos. If serving later, cover the bowl tightly with a cling film and keep it refrigerated till serving. It is a kind of super fruit to me. I love licking it anytime with some tortilla chips. They are perfect to go with it and even with cheese and lays chips. Very delicious and tasty looking recipe.